Collegium 1704 / Václav Luks. Stage director – Willy Decker. Staatsoper, Hamburg, Germany. Sunday, January 27th, 2019. There is something quite remarkable in hearing a twenty-first century audience applaud the curtain calls of a performance of a four-hundred-year-old opera with such warmth and enthusiasm. This was most certainly the case this evening at the Staatsoper Hamburg, for this revival of Willy Decker’s 2017 staging of Il ritorno d’Ulisse in patria. 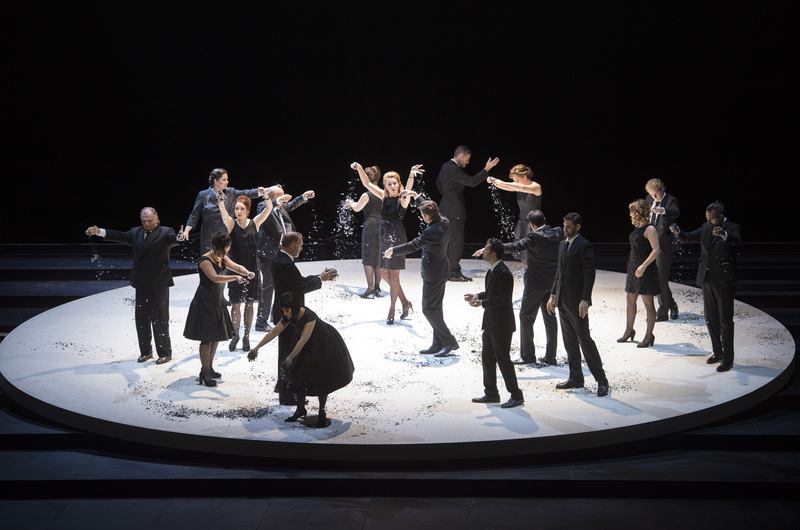 Il Ritorno is perhaps not as widely known and performed as Orfeo or Poppea, for instance, but it certainly deserves to be. It contains some wonderful music – a strong, meaty role for the prima donna and some hauntingly written music for the primo uomo. The plot, adapted from Homer, makes for a compelling evening in the theatre. Decker’s staging is one that is very much based on the principle that less is more. 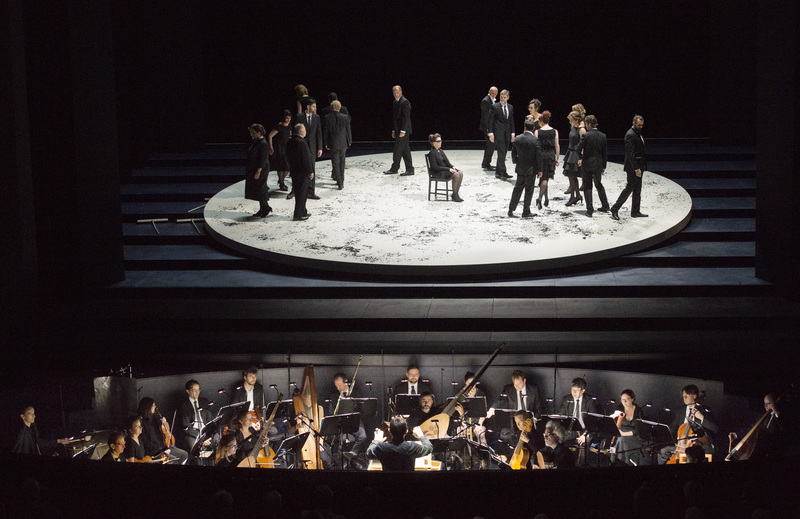 The set (Wolfgang Gussmann) consisted of a single circular platform, that moved around on occasion with, at the back of the stage, a long banqueting table and chandelier, that would appear whenever the gods did, clearly separating the worlds below and above. Costumes (Gussmann and Susana Mendoza) consisted of simple black and white suits, occasionally accessorized with ‘I heart Penelope’ t-shirts for the suitors, with more florid outfits for the gods. It made for a visually beguiling evening because so much was achieved through intelligent, and indeed ingenious, direction of the cast. Decker achieved so much by simply using his singing-actors to create impressive visual effects through their placement on stage, using the cast to surround characters so that they appeared in a different form, for instance. In doing so, Decker allowed the music and narrative to speak through a simplicity of environment that allowed the cast to produce highly believable flesh and blood characters. The downside to this approach was in the acoustic design of the set. The wide-open space meant that there was little for the voices to bounce off from. This was especially noticeable when the singers were placed at the back of the stage. While the quality of the cast was undeniable, these were not the world’s biggest voices. It sounded fine from my seat towards the front of the Parkett, although I did wonder if there might have been issues of audibility further up in the house. Still, Decker has given us a masterful staging, one that feels timeless in its simplicity, yet also utterly contemporary and relevant. The cast brought out the debauched, hyper-sexualized atmosphere of the palace with great abandon, with a fair number of male chests on display for those who admire them. Peter Galliard’s Iro, a lover of the good things in life, in particular food and wine, was deliciously depraved where necessary. The tenderness as Kurt Streit’s Ulisse and Sara Mingardo’s Penelope rediscovered each other was absolutely palpable, due to their deeply moving vocalism. Mingardo gave us a masterclass in using vocal colour to expressive ends. The repeated imprecations of ‘torna’ in her opening number were hypnotic, in the remarkable way in which she exploited the depth and beauty of tone in her claret, full-bodied contralto. Mingardo lives and breathes this music, bringing a naturalness of delivery that feels absolutely right. Not to mention her mastery of using the text as a beginning, rather than an end point, to creating her character. Similarly, Streit’s Ulisse was also sung off the text, bringing his character to life. The tone was bright and forward, with an admirable ease of production. He brought out the torture of Ulisse’s existence through not being afraid to colour the tone, finding a pale desolation that appeared to emerge from the heart of loneliness. The cast was composed both of guests, as well as house ensemble members, and the stylistic acuity with which they performed was impressive. Rainer Trost sang Eumete’s music with improvisatory freedom, finding a beauty in the melismatic writing. Katharina Konradi gave us a delectable Melanto, her crystalline soprano blending quite ravishingly with the plucked strings in the pit. Fabio Trümpy was a magnetic Telemaco, both tortured and passionate, and he also brought out a beauty in the text through his vocalism. Dorottya Láng’s juicy mezzo was ideally deployed as Minerva, using the fullness of her instrument to give the goddess a glamour of vocalism as well as presence. 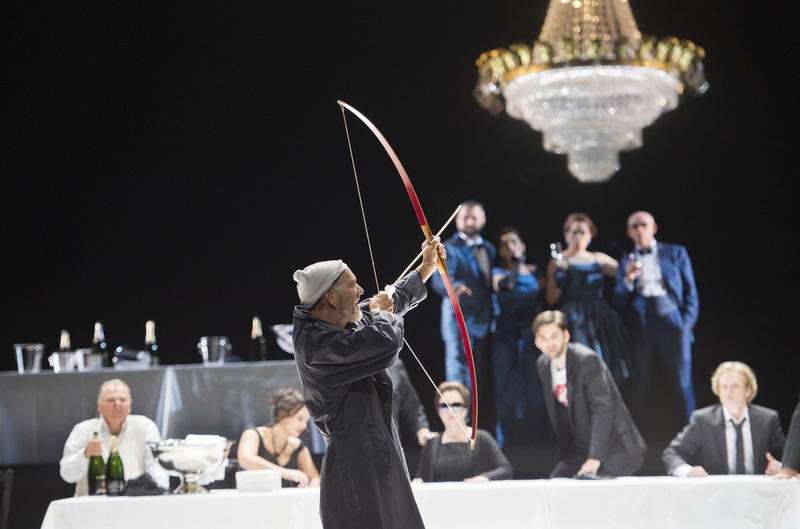 In the remainder of the cast, a special mention for Katja Pieweck’s impassioned Ericlea, Luigi De Donato’s full descents to the sepulchral depths as Nettuno, and Viktor Rud’s gravity-defying baritone as Pisandro. Christophe Dumaux’s compact countertenor was luxury casting in his roles, bringing a voice of impressive sheen and handsome stage presence. Every single role reflected the extremely high standards expected at this address. For this production, the house engaged the Prague-based conductor Václav Luks and his period instrument Collegium 1704. Both Luks and the band were very warmly received at the close. I must admit I was somewhat less enthusiastic. The quality of their playing was exceptional – tuning throughout was impeccable, the brass behaved themselves, and Luks brought out a rainbow of instrumental colour from his forces. And yet, in focusing on this sheer beauty of sound, while completely captivating to listen to, it felt that it came to the detriment of the drama. Although Luks phrased the music with love and affection, the overall impression I left with was one of stateliness. I longed for a firmer rhythmic foundation, one that guided the music, propelled the text, and drove the drama forward. Instead, we had a reading that was undeniably gorgeous and enchanting to listen to, but that lacked the ultimate degree of drama. There was so much to admire in this afternoon’s performance. We were given an intelligent and visually captivating production, one that made so much of so little, and transformed this tale of antiquity into a vibrant and compelling story of love, loss and a fair amount of lasciviousness. It was more than decently sung, and several cases even more than that. In Mingardo’s Penelope, in particular, we saw a master of vocal expression at work. I remain not utterly convinced by the conducting, despite the striking use of instrumental colour and the excellence of the orchestral playing. Overall, however, this was a fascinating evening, one that most certainly brought the work to vivid life. Reading with interest, thank you!